Do you have zucchini coming out of your ears? Well, that is a good look. But here’s a really quick recipe to help you use those veggies up! If you’re like me, you have genetically perfect jet-black goth hair, you watch too much HGTV and you crave peanut sauces. Seriously crave. Like, would-it-be-weird-to-have-this-for-breakfast type cravings. Not to talk batty, but these zucchini noodles are just as satisfying as a big bowl or stirfried noodles. TRUTH! Totally slurpy, flavorful, filling and just, you know, PEANUTTY. My summer has been all about simply prepared, flavorful sauces that come together easily, and fresh veggies right from the garden. But the sauces are really key, because once you’ve got that down, any meal is possible. A container of luscious deliciousness chilling (literally and figuratively) in the fridge means that dinner can be on the table in no time. Keep this spicy, gingery peanut sauce on hand for things like baked tofu with quinoa and veggies, or rice noodles, or just for dipping carrot sticks and cucumbers. ~ These zucchini were sliced the long way on a mandolin, and then further sliced into strips to make noodles. But you can do it the super easy down and dirty way and just make rustic ribbon noodles, like in this recipe. ~ The dressing doubles, and even triples, really well. So make a boatload and use it on everything throughout the week. Place all ingredients in a small blender and blend until smooth. That’s it! Keep sealed and refrigerated until ready to use. Toss the noodles with the dressing, reserving some of the dressing for drizzling. Taste for salt. Top servings with tomatoes, cucumber, red onion, and peanuts. Drizzle with extra dressing as desired. Finish with fresh herbs and serve! This is yet another ICM recipe that makes me want to eat it immediately! Thank you–will be rocking some zuch with this sauce very soon. Yay! I can’t believe I asked the ppk for a peanut sauce and the next day you blogged one. Amazing! I can’t wait to try it! I have everything I need for this! So looking forward to dinnertime!! Why am I not shoving this into my face right now? Boom! Looks fantastic, and yes I DO have zucchini coming out of my ears! Just made this for lunch! Yummy. And a great way to use my garden veggies. i love zucchini at this time of year! yum! Just made this and was very impressed – will definitely become a go-to meal when I’m in a rush and/or have copious amounts of zucchini on hand (which is often). I added bean sprouts and thought it made a great addition – nice crunch, worked well with the other veggies. I also subbed peanuts for slivered almonds and added somewhere in the region of 4 TBSP Sriracha (I like my spice!). Next time, I’ll add some red chili, shredded carrot, tofu, and shredded beet. Yummm…peanutty sauces are delicious! And while I’ve seen many a zucchini noodle recipe around lately, this is the most interesting take yet! Can this be used over rice noodles, instead of zucchini? Thank you for giving me so many amazing options for my plethora of zucchini! I’ve made the zucchini ribbon salad several times this summer and can’t wait to try this tonight! The only thing I will change when I make it is substitute the peanut sauce for almond butter and add some black chana chickpea tempeh. The potluck I am going to next week has people that can’t even be around peanuts. Thanks for this great tasting salad. Isa, can this peanut sauce be served heated with rice or soba noodles? I’ve been looking for a good simple recipe for peanut noodles. Ok just finished eating dinner so I can answer my own question. Obviously Isa’s recipes are always best when made exactly how she writes them. But I just used her peanut sauce from this recipe served hot with rice noodles and it worked perfectly. I now have a go-to recipe for peanut sauce. Thanks Isa!!! Will follow the full recipe next time and I’m sure it’ll be even better! Just made it for dinner. This dish is incredible!! This is SO GOOD! I know I say that about all your recipes, but it’s true. I used the sauce for a spicy peanut pasta toss with broccoli, mushrooms, carrots, and garlic. Delicious! I think next time I’ll try to make a thicker peanut sauce. You are a genius – who would have thought we could make such amazing noodles out of zucchini? Thanks! Made this using Earth Balance coconut peanut spread, because that’s what I had. Delicious. I am addicted to Asian noodles and I LOVED this healthier version. I grated the zuke on a box grater, skin and all, and it was delicious. My first try at zuke pasta, and I’m hooked! I threw in a few leftover rice noodles I had on hand, with tomatoes, cucumber, edamame, peanuts and MINT… amazing! 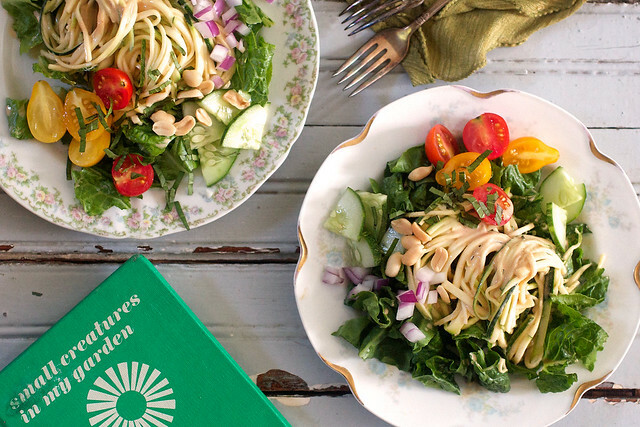 Love that you’re giving zucchini noodles the spotlight! This dish looks so yummy! Just made this up for my lunch for tomorrow. Added some chic peas, red pepper and some mache. Can’t wait!! The sauce tastes amazing and I have tons left to drizzle on *everything* I eat this week. Is it ok to put it on cereal? Is there anything I could substitute for the rice wine? What does it do for the flavor? I’m a serving Peace Corps volunteer and would love to make this . . . but we don’t have rice wine locally. It’s vinegar, so use lime juice instead! i ate this four times last week. amazing! i might actually miss zucchini when it’s out of season this year. Just made a batch of this after making the garlic zucchini recipe twice last week. I can official say I’m hooked! Thanks for all of the great recipes! Woah! It’s both healthy (raw veggies) and decadent (1/2 cup of peanut butter). My family loved it! This is simple, delicious, and inexpensive. Love it! Thank you! Seriously. I made this! You rock. It was outstanding. Superb! Easy to follow recipe empowered me to make it. Thanks! Since I can’t eat peanuts, I subbed some almond butter and some cashews. Amazing sauce for zucchini noodles. I could eat it off the spoon…that good! This will definitely make it into our regular dinner recipe rotation. This is THE BEST peanut sauce ever…could eat it on its own. Used it as a dressing for rice noodle – courgette – carrot – beansprout – tofu salad. I reckon it would taste good with anything though! 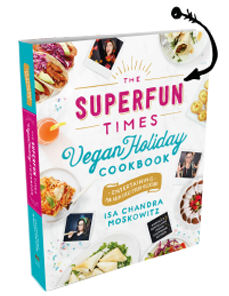 Just ordered your cookbook as well, am not a vegan at all but the recipes are so good!!! Can you cook the noodles? That’s a combination I’m looking for. I will give it a try for sure. Absolutely lovely! Have tried it and it tastes wonderful! I am maybe to actuate your self get being my journal speedily, but i’m very scarcely lost on the entire ton. would possibly you advocate you insight on a liberated from charge application like WordPress or get a paid decision? there ar such an unusually great deal of decisions offered that i’m fully lost. Any pointers? a lot of appreciated a complete ton a complete pack.